How to get there: The nearest town is the mining community of Kiruna in Northern Sweden. Kiruna has flight connections with Stockholm as well as a good highway connection to Narvik in Norway. From Kiruna, drive 63 kilometer to Nikkaluokta, this is the trailhead. There is plenty of parking, they charge SEK 15 per day to be paid in the main building. This trailhead is at elevation 469 meter with coordinates N67:51.071, E019:01.147. Kebnekaise is the highest mountain in Sweden and the highest point in Scandinavia north of the Arctic Circle. The mountain is somewhat isolated from all main highways and a standard climb normally would involve an afternoon hike into the Kebnekaise hut, the actual climb the following day, another night at the hut, then a morning hike back out to the trailhead on the third day. This hike is about 18 kilometer and runs on a good trail all the way. In fact, the hiker will encounter a feature almost unique to Sweden: Long stretches of parallel planks in order for the hiker not to step directly on a trail in Mother Nature. I have absolutely no sympathy for this practice myself. The "bridges" are foreign to the mountain landscape, they do possibly protect some Swedes from getting their boots wet in the meadows, but they are really ugly in an otherwise beautiful landscape. Some people think this is all in order to protect the environment, however, this is clearly false. On this hike the trail crosses only one or two short sections of boulders, what do you find there? - wooden "bridges" in order to make the walk a bit easier. A million hikers could step on these boulders and they would still look pretty much the same. In meadows, yes the track from hikers would be visible, but so what? The worst spots could perhaps be identified and reinforced with a natural element like rock on a very heavyily used trail like this one. This (bad) practice is not unique to the Kebnekaise area. I have seen kilometer after kilometer of the same ugly practice in Sylane (further south), this is an area with little traffic compared to the Kebnekaise trail. Returning to trail description, the trail can be divided into three parts. 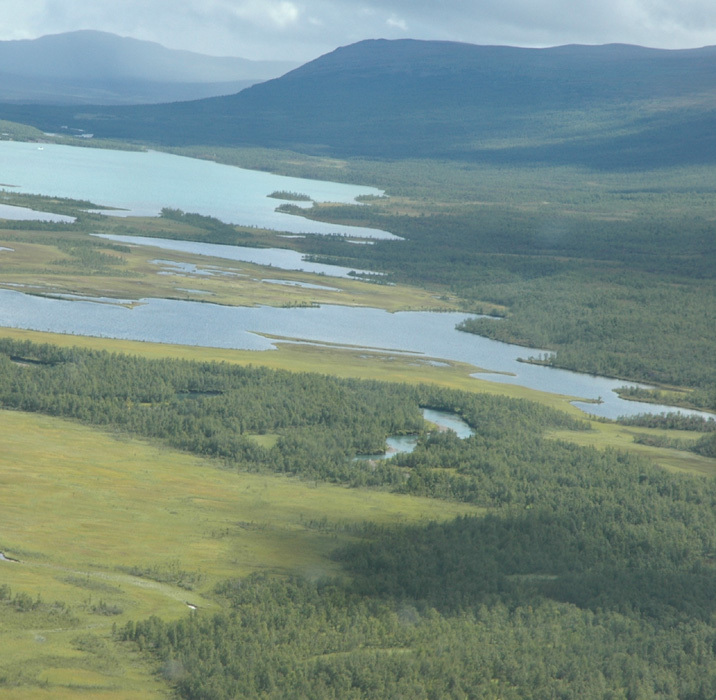 The first part starts from Nikkaluokta, you cannot miss it as it passes under a portal, then heads into the birch forest. Initially, the trail is covered by bark, but this ends soon. 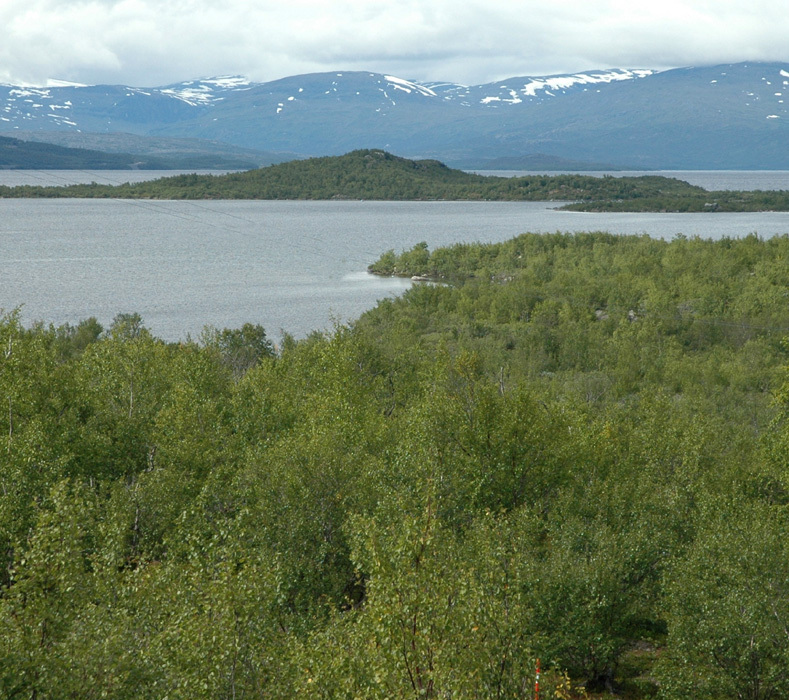 This first section is about 5 kilometer long and runs to the lake Laddjujavri, elevation 511 meter. At Laddjujavri, there are some services to hikers, you can buy food near the lake. Waffels with cloudberries can be recommended. 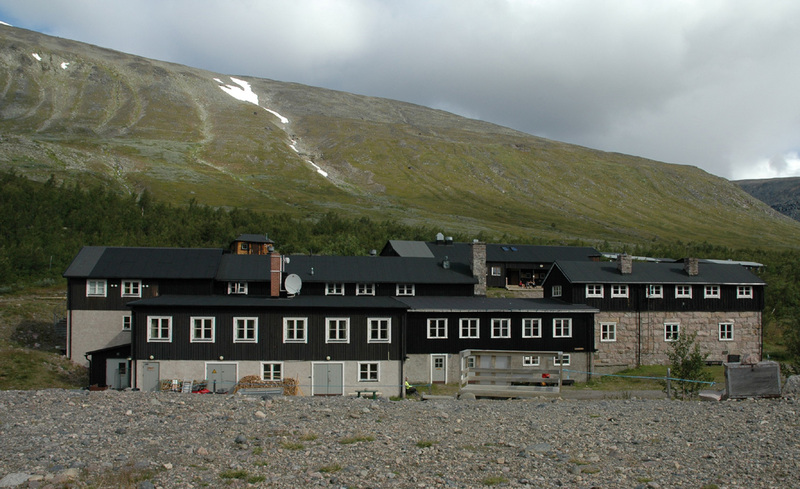 From the upper boat landing, the remaining leg to the Kebnekaise hut is about 8 kilometer. This section is the prettiest as the landscape becomes more varied and the bigger mountains start to appear. The trail curves a bit north towards Darfalvaggi (a valley), then crosses the river on a good bridge before the final kilometer straight west to the Kebnekaise mountain hut. This hut sits at about 675 meter above sea level with location N67:52.089, E018:37.218. There are two routes from the hut to the summit. They start out together and finishes together, but for the most part they split in what is called the East Route (shorter and steeper) and the West Route, longer, but without any exposure or difficulties. 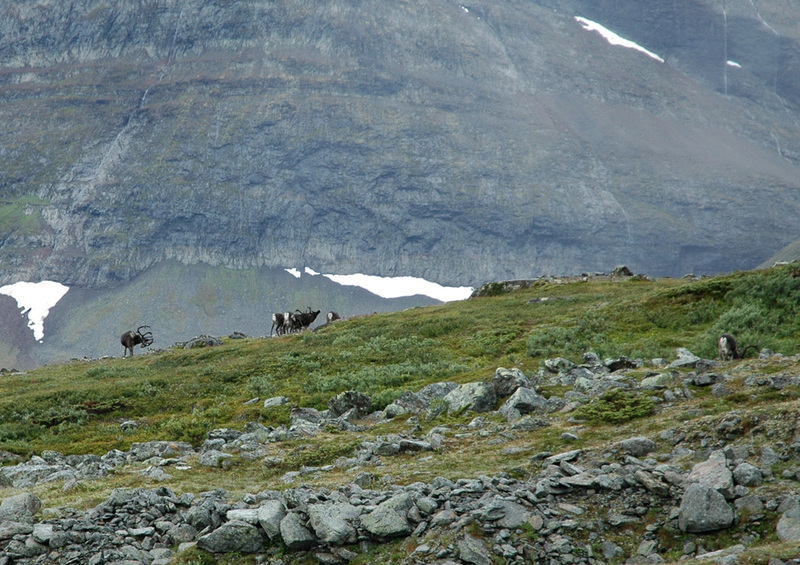 Part 1, leaves the Kebnekaise hut together with the West route, but forks off to the right after a short while. You can easily see the side valley up to your right that this route will follow. The trail climbs on the right hand side of the creek, sometimes fairly steeply. In one place where forward progress is obstructed, the trail makes a sharp right in order to gain higher ground. This section, on rock, has been secured by a short wire, however most hikers will see little reason to use it. Higher up, the trail crosses fairly loose rocks and gravel before approaching a big patch of snow that fills the narrow upper valley and extends to the plateau above. Cross this snow on an ascending traverse to the left. If the snow is hard, then crampons and an ice axe may be useful, however, one may also circumvent this problem by crossing a bit lower and then follow the left side of this snow field up to higher ground. Continue uphill, generally towards northwest. At elevation 1400 meter you should be near location N67:53.112, E018:33.757. Ascend another 100 vertical meter, possibly on easy snow, to reach 1500 meter of elevation, this concludes part 1. Part 2, starts with a flat, small plateau, then a couple of small morraines in order to reach the tiny Björlings Glacier. Cross it more or less going west along a local "ridge", that is, the glacier falls off very gently to your left, but also ever so slightly to your right. This crossing is normally completely free of crevasses, that is, you may spot a few very small ones running across your path, but they will tend to be too small to pose any danger. One can safely attempt this route without any rope or glacier equipment, however, one should naturally be aware of the fact that this is a glacier (although a very small one indeed) and that there potentially could be hazards that need special attention. As you approach the west side of the glacier you will see that the ridge becomes much more distinct and that it rises more steeply up towards the mountain cliffs ahead. Climb this ridge as it gets more narrow with drops on both sides, then gets a bit wider and less exposed on its final section connecting with the rock wall. As you reach the steep rock, part 2 comes to conclusion. Part 3 is the climbing section of the ascent. It is secured with a continuously running (wire) cable bolted to the rock along the route. Thus, it is an easy example of a "Via Ferrata" as it is called in Italy and the Dolomites, or a "Klettersteigen" as such a route is named in Austria and German speaking parts of Switzerland. Most people with limited fear for heights would be comfortable completing this route with a hand on the cable when needed. A completely secure approach is to climb it with a harness and a "Via Ferrata Kit" as is used in the Dolomites. If one ignores the cables, the technical difficulty of this route is YDS class 3, except for a single "crux point" that requires a YDS class 4 move. This section starts at elevation 1745 meter, location N67:53.465, E018:31.083. The route first proceeds right along a ledge, initially with a short descending section. This ledge connects to a gully that runs all the way to the top edge of this rock wall. The first part of this gully is quite easy, shortly before the top you will encounter a short passage where the rock is much steeper (a bit "in your face"), but there are many good foot and hand holds if you take your time to look around. This is the class 4 crux, most people will use the cable as well as an additional fixed rope (with knots) that is provided here. Above this point, the route is quite easy. You pass a memorial plaque for a climber and guide that fell to his death here in 2002. This section tops out at elevation 1846 m, location N67:53.504, E018:30.987, concluding part 3 of this route to Kebnekaise. Part 4 starts out on a very gentle trail among boulders in order to connect with an old mountain hut. Here, the trail also merges back together with the longer West Route. The trail continues up the slope which is gradually more and more gentle, almost flat before you reach elevation 2065 meter at location N67:53.986, E018:30.972. Here, the final snow dome starts pretty abruptly. The slope is steeper and it can be icy. Most of the time hikers do get up here without the use of crampons, however, they might come handy under the most unfavorable conditions. As long as there is some snow (often new) on the slope, the ascent is easy. The short climb to the summit is well protected by the slope of ascent, however, the ridge becomes increasingly more narrow and near the summit you have exposure both left and right. The West Route: This route is longer than the east route, and involves a bit more elevation gain since a smaller mountain, Vierramvare, must be crossed along the way. The route is marked with cairns and red paint the entire way from the Kebnekaise hut to the final snow cone that forms the Kebnekaise summit. Due to a better trail and no difficulties, a strong hiker could still complete this route almost as fast as doing the east route. Where the east route forks right, follow the sign for the west route straight ahead on a good trail that ascends more as you get further into the valley. You must cross two rivers, the second being bigger than the first. Normally, this crossing is not a problem, just find a good spot and cross one section at a time. You may have to step on rocks that are somewhat under water, but they tend to be stable and not slippery. After the river, the trail climbs quite steeply on the left side. There may be a snow field going up at the very end of the valley, but the trail climbs a better line. Here, the route bends slightly south of west as it climbs to the saddle between Duolbagorni (1662m) and Vierramvare (1711m). 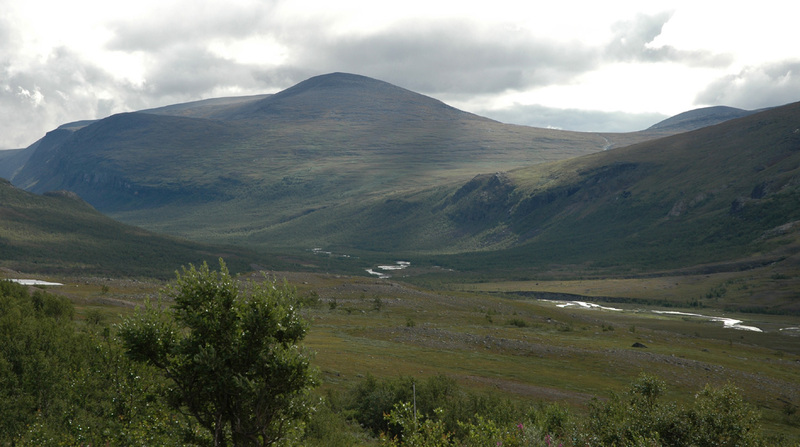 From this saddle, the trail turns more north as it climbs Vierramvare. Actually, the trail crosses the summit about 140 meter east of the highest point, but this is just a few meter lower than the top. Hikers have built hundreds of small cairns where the trail crosses over to the north side of the mountain. Descend almost 200 vertical meter to the 1525 meter saddle separating Vierramvare from Kebnekaise. You will notice this hill better on your return hike. 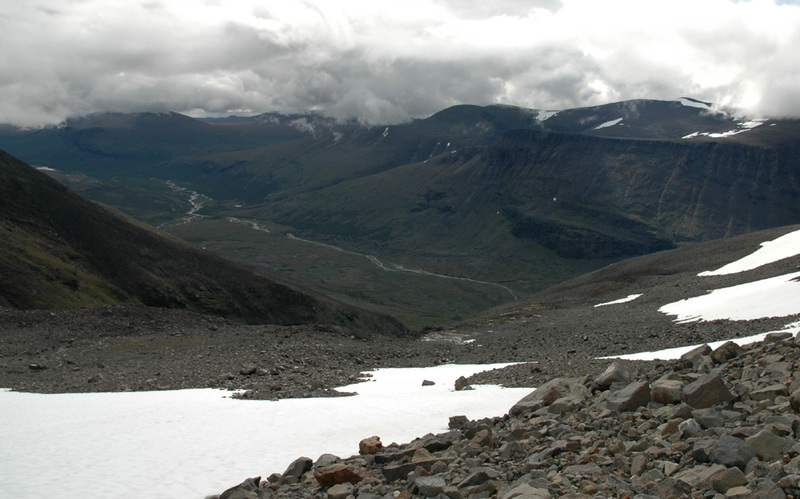 From here on, the trail will gradually climb the south slopes of Kebnekaise. You reach the two huts high on the mountain, merge with the East Route trail and climb more gradually towards elevation 2065 meter at location N67:53.986, E018:30.972. Here, the final snow dome starts pretty abruptly. The slope is steeper and it can be icy. Most of the time hikers do get up here without the use of crampons, however, they might come handy under the most unfavorable conditions. As long as there is some snow (often new) on the slope, the ascent is easy. The short climb to the summit is well protected by the slope of ascent, however, the ridge becomes increasingly more narrow and near the summit you have exposure both left and right. In some locations this works well, people hike/climb with or without the guide based on their own judgement and skill. However, at an increasingly number of sites there is a frightening development. Partly trying to protect their business, guides, hotels and/or even authorities try to make a guided climb THE ONLY OPTION. In fact, I think this is a big error. I believe that even the guide business might improve if one provided more correct information and encouraged people to make their own decisions based on facts readily available. I shall warn against this development and do hope that people who enjoy mountains do work together to prevent what would indeed be a very bad future. There were ample signs of this trend already at Kebnekaise. Deliberately, the mountain hut does not post factual information about the East Route. They explicitly say that the route is not marked and that it is "dangerous". Similarly, the glacier crossing is somewhat blown out of proportions, it could have been a completely safe, marked route across there if this is what one wanted to encourage. They provide no information about the fact that the climbing section is in fact a "Via Ferrata", thus people could bring a "Via Ferrata kit" if they wanted to climb it alone, but with full protection. The guided trip that was supposed to take place when we hiked Kebnekaise was cancelled on short notice, this was the second day in a row and obviously, many people were unhappy. Fortunately, Sweden's law "Allemannsretten" (Every Man's Right) guarantees that anybody can hike/climb anywhere without asking permission. Examples from other countries: On Sicily the guides claim that climbing without them is illegal, they have a big sign supporting this claim, however, the authorities (only when the issue is pressed) contradict this. In Slovakia, there are reports that guides deliberately remove cairns in order for people to get more easily lost unless they use a guide. This is extremely unethical. They also claim that climbing without paying is illegal. In the USA some mountains are owned by people who charge climbers or even try to deny access altogether. These are just a few examples, there are many more. Brief trip report: I did this hike with Edward Earl (Esquared) from San Diego and his Chinese friend (living in Sweden), Fora Chan. We picked her up at the Kiruna airport and we all got completely soaked in heavy rain as we hiked from the trailhead to the lake Laddjujavri where we had a welcome break and some food while waiting about 30 minutes for the boat (as well as finding shelter from the rain). Shortly after resuming the hike, the weather improved and the rain almost stopped. We all arrived at the hut quite wet, but in good spirit. The hike from the trailhead to the Kebnekaise hut had taken 4 hours including a 30 minute wait for the boat and a 30 minute boat ride. The next morning came with more rain and the official guided tour to Kebnekaise was cancelled. However, the rain stopped and the day turned out to be quite OK for walking, despite the clouds (fog higher up) and lack of sunshine. 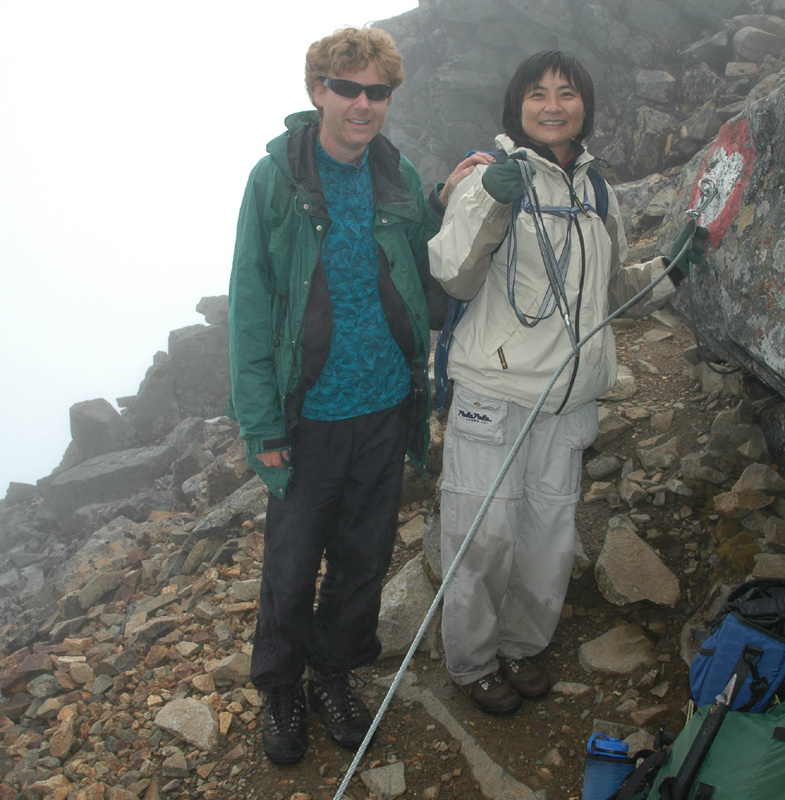 Several people decided to hike the peak via the longer west route when the guide cancelled their scheduled trip. We started out around 0730, having decided to hike the east route up and then return via the west route. I was slightly concerned that the steeper section on the east route could be problematic for Fora. After all, this climb was likely a longer and slightly more advanced hike than what she had been doing earlier. We quickly ascended in the valley leading up to the glacier, Fora did a good job on the somewhat steep snowfield following in the steps that I kicked up and across. The hike across the glacier was a stroll. I wanted to show Fora a crevasse, but had to look long and hard before finding a tiny one, just big enough to illustrate the concept and be able to poke my axe down into it. Soon, we were at the climbing section. I was somewhat surprised to see that the route had been turned into a "Via Ferrata", thought that there should have been proper information about this at the Kebnekaise hut. I immediately decided that Fora should get a chest harness and a sling in order to clip into the cable. In this way she would feel more secure and we would know that she had an extra level of safety as well. The climb went very well indeed. Fora came up the steep class 4 crux without any trouble. On top, we knew that the rest would be easy, however, she was getting tired and we did not summit until around 1400. 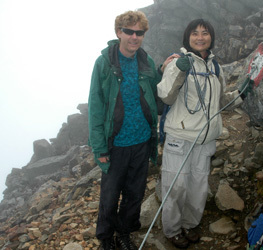 The summit was in dense fog with very limited views. Edward and I set out with crampons to explore the route across to the north summit. Initially, the ridge fell vertically on the left, somewhat more gently to the right. After descending a bit, the ridge became more horizontal, but the drop to the right side became more severe. The only place to walk was on the very top of a very narrow ridge. Blue ice on the steep slopes both left and right, then fog. Very limited visibility indeed. Edward and I stopped and considered the somewhat unfriendly terrain ahead. We did agree that without any idea of how long the ridge would stay at this quality, or possibly get worse before improving, one should consider using the rope for added safety. However, to provide real protection on a ridge like this is not trivial, and we did not have much time since Fora was sitting at the very top of Kebnekaise tired and soon cold. Visibility, in order to judge the entire route would have been very welcome. We decided to leave the north summit alone, a focus on the return hike with Fora that should have first priority. We were interested in the north summit because at elevation 2097 meter, it may become the highest mountain in Sweden in the relatively near future. The map elevation of Kebnekaise is 2113 meter, my GPS measured it to 2109 meter. Thus, if the snow dome melts another 12 meter, then the north summit will take over as the Swedish HP. The north summit is the highest rock point in Sweden. If/when this HP changes, it will become significantly more difficult to climb the highest (and also most prominent) peak in Sweden. We left the summit shortly before 1500, it soon became clear that the return hike would indeed take a long time, as Fora moved more slowly (not faster) downhill than uphill. We had reserved a gourmet (a la carte) dinner at 2000 to celebrate the ascent, thus it was agreed that I should go ahead in order to possibly move the dinner to a later time. Edward and Fora would stay together, the trail was trivial, but quite long. I reached the Kebnekaise hut at 1800, a beer from the store and a warm sauna was just what I needed. I was able to delay our dinner until 2100, just as I was about to (slowly) start the meal Edward showed up and told me that he had guided Fora across the river then gone ahead to inform and catch dinner. Poor Fora, I felt sorry for her. This turned into a marathon test, but she had a strong will and was very brave indeed. 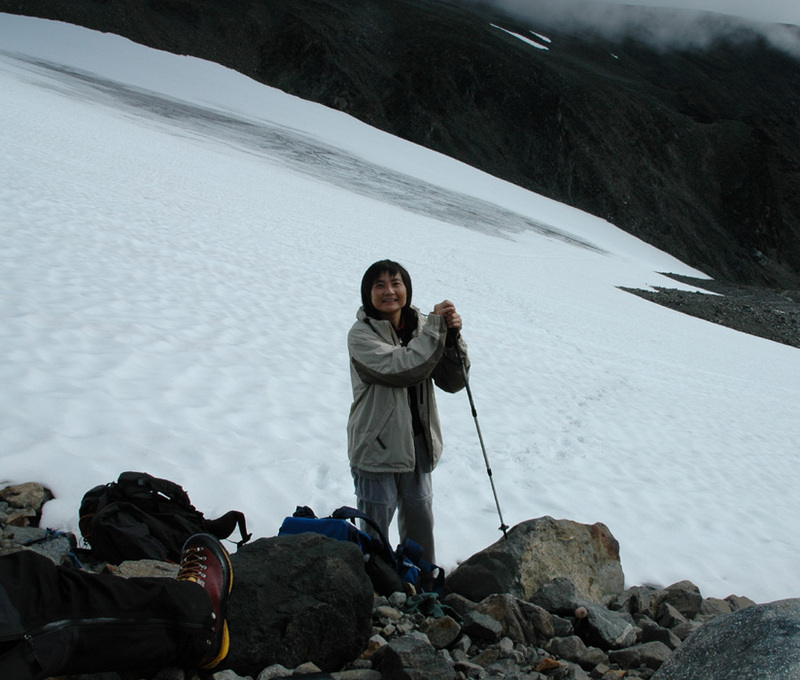 After dinner, Edward went out to meet her and finally, at 2300 after hiking for 15.5 hours, Fora made it back to the hut. Her dinner was saved, but needed heating before serving. The next day, it was pretty clear that Fora should take advantage of the helicopter shuttle to the parking (SEK 500). Her legs and body clearly needed a longer time to recover from yesterdays all out effort. Edward and I started at 0830, we reached the upper boat landing at 1000, had a break for about 15 minutes and let the boat go, then hiked to the other boat stop in about 45 minutes. I could not resist a lunch break here with more waffles and cloudberries. The last leg of the hike took slightly less than an hour and we arrived back at the trailhead exactly 4 hours after leaving the Kebnekaise hut. We then drove back to Tromsø, Norway where we had a next morning flight to Munich in order to continue our E5 trip with an attempt on Zugspitze, the HP of Germany. Reindeer, this is just after the east route forked right. Fora has completed a snowfield. Time for a rest. View back down, we have reached 1400 meter. Fora and Edward on top of the climbing section.